My name is Gina Zurzolo and I am a certified Reiki Healing Master and Teacher. I have always been interested in the Art of healing and have been practising Reiki since 2004. I believe Reiki energy is abundant, creative and has a healing quality. It has the potential and power to change anything and everything. Reiki is a powerful yet simple form of natural energy healing that was developed in Japan by Dr Mikao Usui in the early 1900’s, which is activated by intention. One of the greatest Reiki healing benefits is stress reduction and relaxation which encourages the body’s own natural healing abilities and helps to accelerate the process. The word Reiki (pronounced Ray-Key) is made up of two Japanese words Rei and Ki. Rei – means ‘spiritual wisdom’, ‘higher intelligence’ or ‘absolute consciousness’. This is the wisdom that comes from the higher self or the absolute consciousness of the universe which is all knowing, all powerful, all creative and always present. Ki – means universal life force energy. This is the non-physical energy which animates all living things and is essential to our health and well being on all levels. Reiki has its own intelligence and knows exactly where to go and what to do. It is the higher consciousness called Rei that guides the life energy called Ki in the practice of Reiki. It knows what a person needs and will always adapt itself to create the most beneficial effect that is most appropriate to the individual needs of the recipient. Thus, Reiki can never do harm and is always helpful. Reiki healing is based on the idea that an unseen life force energy flows through us and is all around us. As long as something is alive it has life force energy flowing through it and around it. The body depends on the flow of universal life force energy flowing through it in order to stay alive and maintain health. Energy flows through the physical body through seven main centres called chakras and twelve energy pathways called meridians. It also flows around us in a field of energy called the aura. Life force nourishes the organs and cells of the body, supporting them in their vital functions. It is the flow of this energy, within and around the body, which defines the quality of our health and well being. The natural and balanced flow of life force energy within and around the body promotes optimum health and well-being. If one’s life force energy becomes disturbed, blocked, depleted or unbalanced in some way, then dis-ease and illness usually begin to take form. Reiki provides a means to balance the human energy fields and energy centres. It heals by flowing through the affected parts of the energy field and charging them with positive energy. It replaces the depletion of energy, breaks apart the energy blocks and clears, straightens and heals the energy pathways, re-establishing the natural and healthy flow of energy within and around the body. Since everything is made up of energy, working directly with energy works on all levels, promoting physical, emotional, mental and spiritual well being. Reiki is a very relaxing and soothing experience. During a Reiki treatment, the recipient simply lies on a massage couch. If they are unable to lie down the treatment can be given in a sitting position, the main thing is for the recipient to be as comfortable as possible. (There is no need to remove clothing as Reiki will pass through anything, even a plaster cast). The Reiki practitioner places their hands gently on or over the body, in a series of non-intrusive positions covering the whole body. Each hand position is held for several minutes. The recipient automatically draws in only as much Reiki as is needed, using it in whatever way is most appropriate at the time. The whole person is treated, not just isolated areas. Note: Reiki does not involve massage, although the relaxing experience could be the same or even deeper in many cases. How often do I need to have a treatment? Even one single Reiki session can be quite a relaxing and transforming experience, however long term imbalances in the body sometimes require several sessions in order to facilitate the level of relaxation needed by the body to heal itself. The frequency of treatment will depend on the needs of the individual. Treatments are available on a weekly, fortnightly, monthly basis, or less frequently as defined by the need. Treatment plans based on your own needs will be discussed, established and reviewed as needed based on changing circumstances and personal preferences. After a Reiki treatment, it is suggested that you drink plenty of water to help clear toxins from the body. 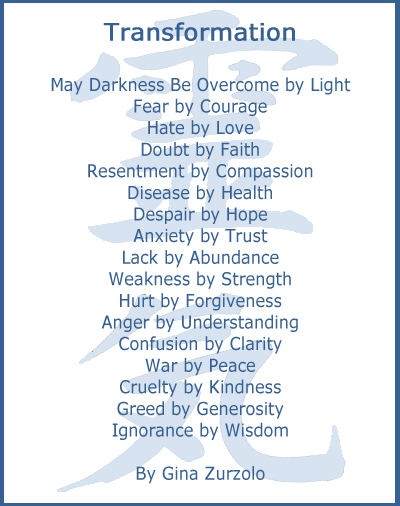 There is no belief system required for Reiki to work so anyone and everyone can receive a Reiki Treatment. Reiki can also be used alongside other forms of treatment, both conventional and complementary, and can help reduce side effects from medical treatment or medication and aid recovery. Reiki is a means of facilitating the body’s own natural healing abilities and is in no way meant as a substitute for medical, or psychological, diagnosis and treatment. If you have a medical or psychological condition, it is recommended that you see a licensed health care professional while receiving Reiki treatment. Reiki is a powerful catalyst for self-improvement and positive change which can lead you towards a more meaningful and fulfilling life! Healing operates on the basis that, as human beings, our innate nature is already perfect and whole. The goal of Reiki is to restore the body to natural health by correcting imbalances and returning the individual to a state of balance and harmony. The most important step in the healing process is our intention to heal ourselves.